At the beginning of the Industrial Revolution, people had no idea how machines would change their lives. Today, as we’re poised at the precipice of the Fourth Industrial Revolution, we can relate. The next generation of wireless technology, 5G — with the ability to transmit data at speeds 50 times faster than today — promises to bring seismic change. This technology will enable advances in virtual and augmented reality, Internet of Things, artificial intelligence, robotics and more, creating a future world as astounding to us as our present world would be to someone born 250 years ago. In the next decade, our lives will change significantly in many ways, including the way we work. A report by the Institute for the Future (IFTF) forecasts that 85 percent of jobs needed as early as 2030 have not been invented yet. Although predictions differ, most experts agree tomorrow’s workers must have a new skill set to thrive. In the impending era of human-machine partnerships, humans’ contribution will include computational thinking, an entrepreneurial mindset, and a nuanced understanding of culture, society, business and people, according to the IFTF report. The World Economic Forum’s The Future of Jobs report agrees that similar skills will be needed by future employees: complex problem-solving, critical thinking, and creativity. To instill tomorrow’s workers with these abilities, today’s educators must help students develop them. Early in his tenure at Vista, Vodicka kicked off a personalized learning initiative by entering two middle schools in the Verizon Innovative Learning schools program. The program gave every student and teacher at the middle schools a tablet with data plan to use throughout the school year. Also, the teachers received professional development to integrate technology into the curriculum, facilitated by a Digital Learning Coach, who was assigned to each school to provide individualized support to the teachers. With the tablets, 24/7 access to the internet and innovative curriculum, teachers at the two Vista middle schools began the transformation to a student-driven teaching model that empowers students to drive their own curriculum and focus on creative problem solving. The program is helping students develop computational thinking skills, a “necessity for fully participating in a computational world,” says Karen Cator, president and CEO of Digital Promise, the national nonprofit that administers the Verizon Innovative Learning schools program in partnership with Verizon. Cator, whose organization is dedicated to closing the digital learning gap in schools, is a leading voice for transforming American education through technology, innovation and research. “Students certainly need to know how to use technology,” she says. “In fact, many of our middle school students are more proficient at using basic technologies than the adults around them. But more important than basic proficiency is the ability to solve problems and create solutions using technology. Our students need to learn to thrive in a computational world.” Computational thinking is not about learning a particular programming language, but about mastering the principles and logic behind coding. This skill set enables students to understand and employ qualities that are uniquely human and apply concepts across disciplines to analyze and solve complex problems. Preparing students from all backgrounds for the future requires a transformation in how students learn today. Like the 18th century textile workers who walked into factories and were challenged about how to make fabrics with spinning machines, today’s students must understand what technology can and cannot do, and why developing problem solving skills is important to their success. Millions of American students lack the tech access and skills they need to succeed in the digital world.3 Verizon has been working to help solve this problem holistically through a transformative program called Verizon Innovative Learning. 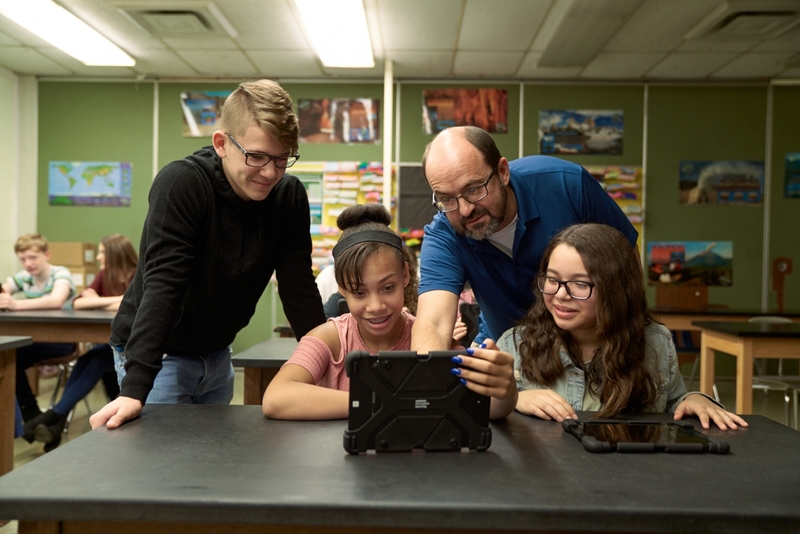 Verizon Innovative Learning provides free technology, free internet access, and hands-on learning experiences to help give under-resourced students the education they deserve. Powered by a next-gen, technology-infused curriculum that fundamentally changes the way teachers teach and students learn, Verizon Innovative Learning is giving kids the ability to do more in this world. Students are showing improvement in math and reading, and they’re more engaged in school.